As 2018 draws to a close, kitchen designers are drawing breath ready to set off on new adventures in 2019. Home design trends evolve in line with fresh styles and innovations, and the kitchen is no exception to that rule. In fact, the kitchen is usually the trend-setter, as it’s the hub of many homes and therefore the most important room in the house. Did it ever really go away? Black has always fit perfectly with the smooth and contemporary style of German kitchens, but 2019 promises a resurgence of black kitchens across the spectrum. All-white has been popular for a while now, but dramatic shades of black are set to take over in the coming year. One major benefit of black, of course, is that it hides all those scuff marks and signs of wear that are the hallmark of a well-loved kitchen. Whether it’s black cabinets and counter tops or black steel appliances, black is most definitely back. While the idea of mixing two bold colours within your kitchen space can be a little nerve-wracking, it can also work brilliantly well – if they’re chosen carefully and suit your space. For instance, painting cabinets in contrasting shades of one lighter colour and one darker adds a unique splash of colour to your kitchen without overwhelming it. Plus, it looks stunning. This is a trend to watch out for in 2019. Natural stone has long been a popular choice for cabinets, but stone is edging its way across the entire kitchen. 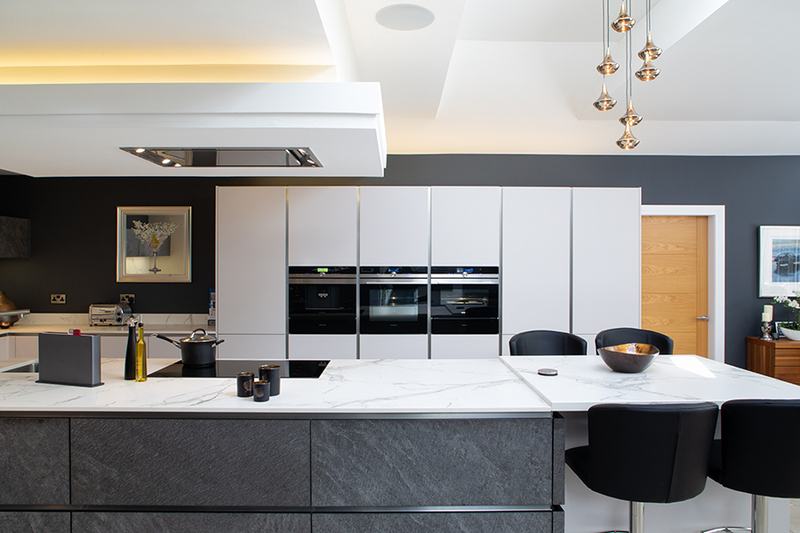 You can expect to see more natural stone in kitchens in 2019, with designers choosing it for back splashes and even fabricating hood vent covers and drawer fronts from it. Natural stone can be an excellent counterpoint to the sleek matte black utilised in many German kitchens, so why not give it a whirl? In recent years, kitchen trends have been all about keeping things hidden. Out of sight, out of mind – and you could pretend that the room wasn’t a kitchen so much as a living space with a lot of counter tops. However, the new trend can be boiled down to one phrase – “if you’ve got it, flaunt it”. While the design of your units and appliances is still likely to be minimalist, open shelving is experiencing a resurgence and allowing you to display those utensils, glasses and pans that you’re most proud of. Don’t worry – there’ll be plenty of hidden storage for those items that are best kept out of sight! Designers are using technology to make the hub of the home healthier and safer. As well as improved extractor hoods and food storage methods, décor in some kitchens is set to be earthier, bringing elements of nature into the home. Stay tuned for greens, reds and steel tones that can be seamlessly combined with natural stone or metal. It’s the next step towards making the kitchen the healthiest room in the home.